Charles Marshall is known throughout the industry as one of the best sales speakers in the country. With over 30 years of sales experience behind him, Charles communicates positive concepts and immediately implementable ideas in his uplifting, energetic and informative sales presentations. Charles is also, the author of the popular personal development book, The Seven Powers of Success, which is written to build and enhance successful thinking. If you’re looking for the best sales speaker there is, hire Tony Robbins. If you’re looking for a more affordable option, who will leave your audience inspired, informed, and enthusiastic, then Charles Marshall is your man! Tired of waiting for your ship to come in? Maybe it’s time to grab a hammer and build a boat! In this hilarious and fun-packed presentation based on his best selling book, The Seven Powers of Success, Charles shows how implementation of The Seven Powers™ can create success in the life of any individual or organization. 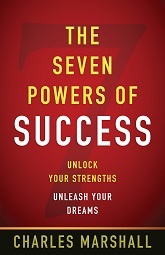 Through the use of humor and real-life examples, Charles relates inspirational stories of everyday underdogs who have used The Seven Powers™ to overcome obstacles and achieve success. The Seven Powers of Success™ is one of Charles’ most popular programs for sales organizations and is sure to be a hit with your crowd.